Picked up Annabelle yesterday, February 27th, 2019. After running into so many scams and horror stories about puppy farms it was so nice to meet a family who truly cares about their pups. This was a friendly family setup with wonderful people. 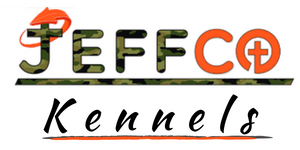 I will recommend Jeffco Kennels to anyone. Do not hesitate to reach out and visit these wonderful people. Jeff and Lisa are great! MY wife Brandy and I bought 2 male labs (blonde and black)off a litter from Moses and Angie. We love our pups Moses and Zeus! Having owned labs my entire life, these 2 males are picture perfect "block heads" with tons of instinct. At only 12 weeks both sit and come on voice and whistle commands. They are well tempered, loveable, and naturally best friends. Thank Jeff and Lisa for the opportunity to own such beautiful angels!